This is my final review of this week on entry level and bottom shelf whiskies. Those whiskies being Jim Beam White Label, Jack Daniels #7, Chivas Regal 12 yrs old, and Johnnie Walker Red Label and Black Label. Now I had started this series of whisky tastings because I needed some sample bottles for a whisky exchange and after buying the bottles I thought it might be fun to actually sit down and analyze these whiskies, some of which I had some of my first drinks with and see how they'd changed and to hopefully give me a better appreciate for the good whiskies I now get to experience now that my paychecks are a little bit better and I'm more educated. You can't appreciate the good stuff in life until you've experienced the bad and indifferent stuff. So last night I get home from work, head over to the computer after getting a kiss from my wife and giving my furry kids a hug and I sit down to do my whisky stuff and I crack open the last sample bottle. Now this has been the whisky that has had me the most excited out of this recent batch. Simple: I'd heard nothing, but good things about this whisky. Actually let me rephrase that statement. I'd heard nothing, but GREAT things about this whisky. As soon as I pour it into it's glencairn I can immediately smell apples coming off the glass. Very cool. But I'm not quite ready to start, so I cover the whisky and finish my emails then join my wife to watch MasterChef. So I sit down and remove the lid and again apples come wafting out, so much so that my wife can smell them from where she's sitting. I enjoy the smell of the apples for a minute or so and then decide to nose the glencairn to see what else I can see, or smell as the case is. Cinnamon comes wafting out, spices, some honey, smoke and peat and just a hint of earth. Very cool and extremely complex stuff. Especially considering that this is a blended whisky. After about 30 minutes of just nosing this I decide to give it a taste. Apples, Sultanas, Peat, Smoke, Earth, Honey, Cinnamon, Oak, hints of vanilla. This is what courses through my mouth, each flavor calling out one and two at a time, shouting for my attention. I have to sit there and mouth the whisky around my mouth trying to pin point what each individual component I'm tasting is and what is where. The finish is surprisingly long, being very dry and quite salty. The apples and sultanas follow it all the way down, catches in the back of the throat, decides to visit for a minute and then follows the rest of the whisky. Very very cool stuff! And this is available for only $35-40 AUS!? Dram good value for money!! And thus ends this weeks exploration into entry level whiskies. But don't worry another whisky is on the block for tonight! Now I'd said earlier that I would have what I hoped would be an amusing story for everyone at the end of this review and here it goes! When I'd decided that I needed sample bottles and I'd had no luck finding any on ebay, craigslist, etc I decided to pick up the sample bottles from Dan Murphy's and use those. Walking home that night I thought to myself that since I'd never sat down and analyzed those whiskies that it might be quite a bit of fun to do so. However I didn't tell anyone about this idea. Now just a couple days ago I was called a snob on the Connosr forums on a review (if you're curious please PM me.) This left me gobsmacked! I don't consider myself a snob and avoiding being snobbish is something I try VERY hard to avoid. That morning when I told my wife in the shower about me being called a snob by a Connosr member she looked at me and informed me "Well honey, I hate to say it, but you are a snob." Que sound of jaw hitting the floor. "What do you mean Babe?! I'm a snob?! How so?! If I am being a snob without realizing it this is something I need to correct." "Sweetie, we have alot of whiskies right?" She asks me and when I agree to this statement, she continues on. "Now out of all those whiskies how many of them would rate below say 80 on most reviews?" "Just a couple, The Canadian Club, The Glenlivet..."
"Exactly my love! You dear, research your whiskies to death. You don't just go into a bottle shop and grab a bottle of whisky, you sit there, research, analyze, then you start exploring trying to find whatever one has your current notice. Most people would just say I need a whisky and go into a bottle shop and grab the cheapest one they saw or one they'd had before, not you Babe. And that Sweetie, makes you a snob. Not a bad kind of snob, but a snob nonetheless." I tried to explain about limited whisky money and making each bottle count, but there you have it folks, I'm a whisky snob! Good stuff! The Black is (was) my standard go-to drink at pubs and clubs when I wanted a cheap, neat Scotch. 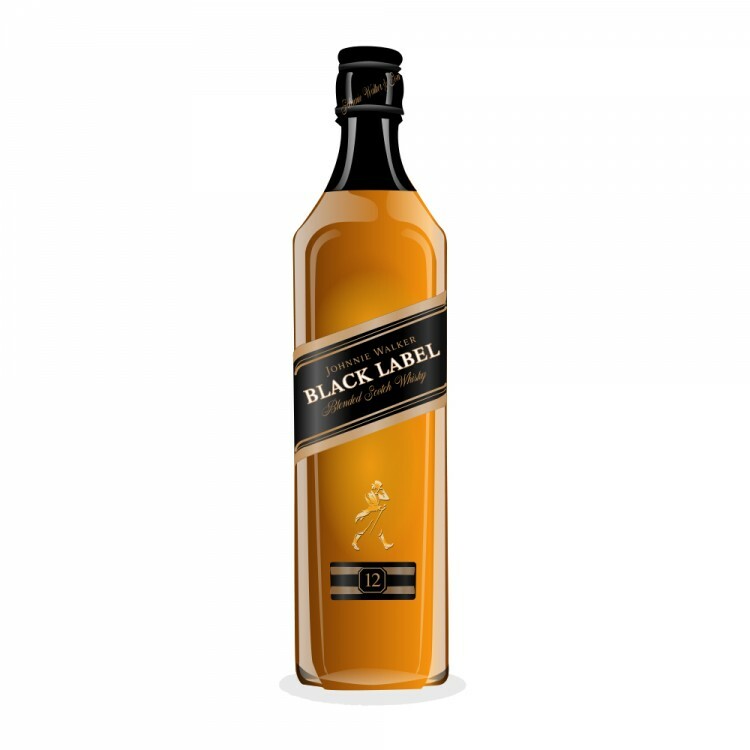 I'm curious to try the Double Black, apparently it's smokier than the standard Black. As for your being a "snob", I did see that mini discussion you're referring to and thought "I'll leave this one alone" - as you said, better to not feed the trolls! But if your wife's definition of snobbery holds up then I guess you ARE a whisky snob. And so am I. Do I care? Nope. Although the term "discerning whisky drinker" sounds better, I think! For me, a snob looks down their noses at others; I'm pretty sure you're not like that however! @Systemdown I think that the review you and I were discussing, my comments on it must have fed a troll because now I have one following some of my reviews hahaha. Just like to say that I personally have been enjoying your reviews very much and have said before that I wish could write like you. I am still very hesitant about writing myself it's not something I am comfortable with. I am sure my wife agrees with your wife as I spend alot of time researching my next best bang for the buck whisky. Keep up the great reviews.